Light, healthy eating comes naturally in January. We’ve had our fill of finger foods, crown roasts, chocolate-, caramel- cranberry-everything and all the edibles that holiday traditions bring to the table. The perfect antidote to high-falutin holiday feasting is seafood. I crave it every January. 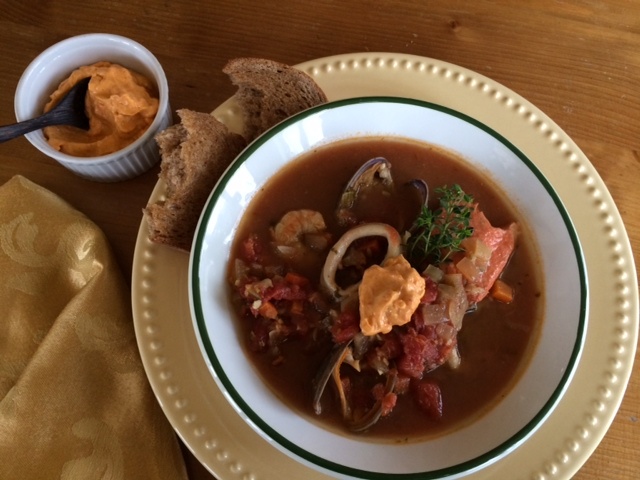 This year I took inspiration from southern France for post-New Year entertaining with Bouillabaisse. Sunshine in a bowl – it is a medley of seafood in a rich tomato broth seasoned with a double hit of fennel, golden saffron, orange zest, garlic and herbs. I call this “Northwest Bouillabaisse” because I use seafood from my home, the Pacific Northwest. 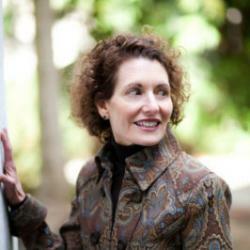 My version is a hearty seafood stew, not a soup, with a nourishing fish filet anchoring each bowl. It is inspired by the recipes and writing by and about Julia Child who lived in Marseille, France, where the dish likely originated. Rosy sockeye salmon is the star of the stew, supported by shrimp, calamari and clams. Frozen seafood is often our only option this time of year. I’ve found the quality of individually wrapped frozen salmon filets is excellent. A day before serving, unwrap the filets, place them on a rack over a shallow tray and thaw in the refrigerator. Pacific cod (sometimes called Alaska or True cod) may be available fresh and is a good, meaty alternative. Substitute whatever seafood is available to you – this is casual and personal cooking. Enrich the stew with a spoonful of rouille, which means “rust” in French, referring to the gorgeous color of the spiced-up mayonnaise-like condiment. This version is made with olive oil, roasted red pepper, garlic and cayenne for spark. Croutons of toasted rustic bread brushed with garlic-oil can be placed in the bowl before adding the soup or served on the side, spread with more of the irresistible rouille. If you are lucky enough to have any rouille leftover, it makes an outstanding spread on a wrap, sandwich or omelet. Making a seafood broth is well worth your time for the deepest flavor foundation This recipe is easy with shells saved from the shrimp and bottled clam juice. Don’t be daunted by the length of the recipe. The rouille, seafood broth and bouillabaisse base can be made a day ahead and will taste even better with a chance for the flavors to meld. Good-for-you eating doesn’t mean compromising good taste or good times. Launch the New Year with a vow to enjoy healthful ingredients wrapped in bold flavors and beautiful colors. Put away the silk and sequins, grab your favorite jeans, put a pot on the stove and call in some friends. A bouillabaisse party is casual and a little messy – that’s how the fun begins. Feel free to customize the seafood choices to what you like and find available in your area. Time the cooking by adding longer cooking seafood such as thicker filets first and quick-cooking choices like shrimp and squid later. For an even heartier soup – or as an alternative to the Croutons, add bite-size pieces of red potatoes; add a couple of minutes before the seafood to give them a head start in cooking. 1. 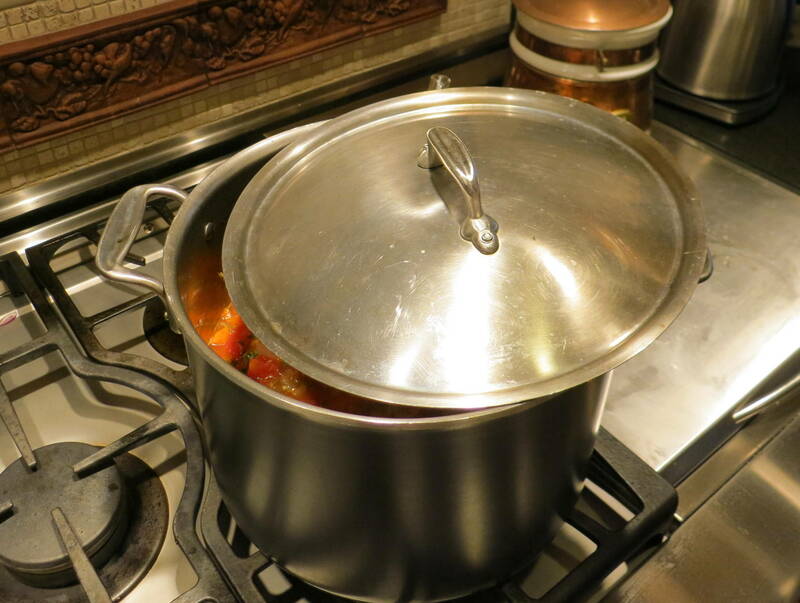 Make Shellfish Broth: Place water, clam juice, shells and lemon slices in large Dutch oven or heavy stock pot. Cover, bring to a simmer and cook for 30 minutes. Strain. Discard solids. Measure broth; if needed return to pot and simmer until reduced to 8 cups. Chill until ready to use. 2. Make Rouille: In blender container, combine egg substitute, bell pepper, garlic, lemon juice, salt, cayenne pepper and paprika. Whirl until blended. With machine running, slowly pour in oils to make an emulsion. Stop machine and scrape down side of container as needed. Taste and adjust seasonings to your taste. Scrape into a small bowl, cover and chill until serving time. 3. Make Garlic Croutons: Combine oil and smashed garlic in a small saucepan and warm on the stove over medium-low heat for 30 to 60 seconds or until fragrant. (Or place oil and garlic in a microwave-safe bowl and micro-cook for 30 to 60 seconds.) Cool. Discard garlic. Brush oil on bread slices. Place slices on a baking sheet and heat in a preheated 350° oven for 8 to 10 minutes or until toasted. 5. Finish Bouillabaisse and Serve: Bring stew base to a gentle simmer. Add salmon filets and clams; cook 5 minutes. Add shrimp and squid; cook for 2 minutes or until shrimp are bright pink. Check to make all seafood is just cooked through. Remove from heat. Remove and discard bay leaves and any unopened clams. Taste and add salt as needed, to taste. Stir in freshly chopped herbs. To serve, place one salmon filet in each serving bowl and top with remaining seafood, dividing evenly. Ladle broth over seafood. Top with a spoonful of Rouille and pass Garlic Croutons. Thiss could be a issue with my browser because I’ve had this happen before.